The story begins with a narration of Michael Burnham (Sonequa Martin Green) relating an ancient African myth of a young girl who scattered ashes across the sky and created our Milky Way galaxy. Afterward, we flash back to her childhood, when the orphaned Michael was taken into the home of ambassador Sarek (James Frain) and his human wife Amanda (Mia Kirshner) on the planet Vulcan. She also recalls her initially tense meeting with their young son Spock, who shuns the human girl coming into his home. Sarek and Saru are on the bridge when a distress call is received from the USS Enterprise. Captain Christopher Pike and a member of his crew beam over to Discovery from the Enterprise. After some initial comm difficulty, Pike is beamed aboard the Discovery, along with an alien crew member and a rather arrogant Enterprise science officer who is not Spock, much to Burnham’s surprise. Pike then delicately informs acting captain Saru (the ever-talented Doug Jones) that he is assuming temporary command for a special mission (a scene that reminded me of Kirk breaking similar news to young Captain Decker in “Star Trek: The Motion Picture”). Stamets and Tilly share a moment in engineering, where he gives the new ensign a few words of advice. In engineering, there is a nice scene between newly minted Ensign Sylvia Tilly (Mary Wiseman, wielding her character’s new authority as an officer) and Lt. Commander Paul Stamets (Anthony Rapp), the father of the ship’s unique Spore Drive. A grieving Stamets tells Tilly he is leaving the ship to accept an offer to teach at the Vulcan Science Academy. Stamets is still in mourning following the tragic loss of his lover, Dr. Hugh Culber (Wilson Cruz). Tilly asks him not to leave, but Stamets is adamant. Enterprise and Discovery crew share an awkward turbolift ride, in a scene that feels almost like something out of “The Orville” for its humor (and color). Pike does a quick meet-and-greet with the bridge officers as Discovery leaves the disabled Enterprise (currently under repair) and gets underway to discover the source of red, pulsar like signals that are of vital importance to the Federation. The investigation takes the ship into a natural debris field surrounding a pulsar of very unusual gravitational properties; which make navigation, or use of the transporter, extremely problematic. Using Discovery’s telescopic array, Burnham discovers a crashed Starfleet medical frigate, the USS Hiawatha, on the surface. 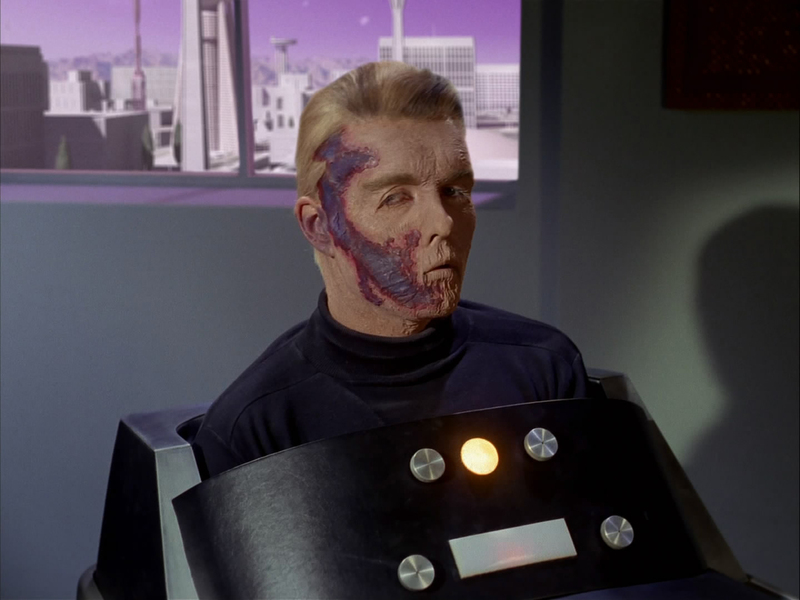 With possible survivors, Burnham suggests to Pike that they take personal EVA pods down to the surface of an asteroid, since a shuttlecraft would face the same navigational difficulties as any other ship. Before they disembark, Tilly asks if Burnham can bring back a sample of the asteroid, since it has previously unseen gravitational properties. Burnham vows to try. Burnham enters the wreckage of the crashed medical frigate USS Hiawatha. The sequence that follows is a white-knuckled, dizzying ride through the debris field to the surface of the asteroid. The snobbish Enterprise science officer is killed when he arrogantly rebuffs Michael’s suggestion to switch his pod to manual control. Pike’s pod is also compromised after a minor impact, and his EVA thruster suit malfunctions. Reiterating a conversation between she and Pike earlier, Burnham tells her new captain that Discovery doesn’t leave any of its own behind. With that, she ejects and rescues Pike in the nick of time, hitting the thrusters on her own suit for a soft landing. The Discovery rescue team encounter the survivors of the Hiawatha, remnants of the Klingon war. On the surface, they find the crashed USS Hiawatha, and encounter several tiny drones which lead them to the survivors, who are being kept alive by sardonic chief engineer (turned-emergency surgeon), Commander Jett Reno (comedian Tig Notaro). Comedian Tig Notaro is sardonic engineer-turned-brain-surgeon Jet Reno (possible homage to former US attorney general Janet Reno?). Reno’s ship crashed during the Klingon war, and she is surprised to hear that that war is over and that an armistice has been declared. With Burnham’s valuable aid & assistance, Reno helps prepare her remaining crew for transport up to Discovery. Signal boosters are hastily rigged to the Hiawatha’s transporter room and most of the crew are safely evacuated back to Discovery… except, of course, for Burnham. Michael Burnham is the last to escape the wreckage of the Hiawatha. During her attempt to outrun the rapidly disintegrating shipwreck (the Hiawatha is being torn apart by the unstable gravity of the region), Burnham catches a piece of white-hot shrapnel in her leg and sees a vision of what appears to be a ‘red angel’ standing before her. The ‘angel’ dissolves into Pike, who has returned to rescue her. They’re beamed back to the Discovery in the nick of time. Snaring a giant piece of the unusual space rubble in the main shuttle bay. In sickbay, Burnham tells Tilly she had the sample in her hand but it didn’t beam up with her, which confirms its physics-defying properties. While recuperating, Burnham comes up with a plan to capture a larger piece of the disintegrating asteroid (which broke up in proximity to the pulsar). The Discovery’s main shuttle bay will open its forcefield, envelop the drifting debris and ensnare it. It works, to the delight of Tilly and Stamets, who high-five each other over this amazing specimen of incalculable value. Pike and Burnham come to an understanding about having each other’s backs. The landing party follow drones to the survivors of the Hiawatha. With a more traditional Star Trek feeling to it, as well as more humor (and less sturm und drang), this first episode of season two is almost like a soft reboot of Discovery, much as Deep Space Nine’s “Way of the Warrior” kind of re-sold that series when it added the character of Worf to the ensemble. Anson Mount does a hell of a job as Captain Christopher Pike, following in the footsteps of Jeffrey Hunter, Sean Kenney and Bruce Greenwood. While the regular cast each have their moments in “Brother”, a lion’s share of the episode’s energy and charisma belongs to Anson Mount’s “Captain Pike”; Mount’s performance not only recalls Jeffrey Hunter’s, but also fits in very easily with his (temporary) new crew. He has an effortless charm that brightens the entire show. It’s almost a shame that the series is making an attempt to fit this timeline in with the original series, because we then know Pike’s assignment will only be a temporary one (not to mention the horrible fate awaiting Pike a few years later in “The Menagerie”). Sonequa Martin Green is Michael Burnham. Sonequa Martin Green gives it her all (as usual), but once again, her melancholy Michael is often outshone by her lighthearted costars, particularly the aforementioned Anson Mount (now the fourth actor to play Pike in Trek’s history), the ridiculously talented Doug Jones (whom I had the pleasure of running into last weekend at a trade show in Pasadena), and the charming, babbling Mary Wiseman as Ensign Tilly. The ever-nervous and awkward Tilly jokes with Stamets that she is “drunk with power” as a newly minted officer, and the actress has a lot of fun playing that new aspect of her character. If I have any nagging nits, they’re with the story. I’m not quite sure if this second “Search For Spock” has the legs to carry a season. The ‘red angel’ arc could also be very easily mishandled, since Star Trek has traditionally been leery of religion, and has embraced a long history of secular humanism. As Spock himself once stated in the Original Series episode, “The Galileo Seven”, “I, for one, do not believe in angels.” Since TOS takes place several years after the events of Discovery, that admission kind of takes the surprise out of this new angel arc. We know the crew won’t be encountering a ‘real’ angel, otherwise older Spock wouldn’t doubt their existence in his own ‘future’. Nits aside, this first episode of the second season felt fresh, had some stunningly theatrical action-adventure scenes, and best of all, there were nice helpings of subtle, character-driven humor. Anson Mount’s charismatic interpretation of Captain Pike will be very much missed when his tour of duty aboard Discovery is over, though I’m also looking forward to when Captain Saru is ready to take the center seat someday. Previous Post “Hellboy”‘s 15-year reunion is one of the highlights at IMATS in Pasadena.